Working the ECO ways can be exhausting… or so we’ve heard, because we’re just getting started. 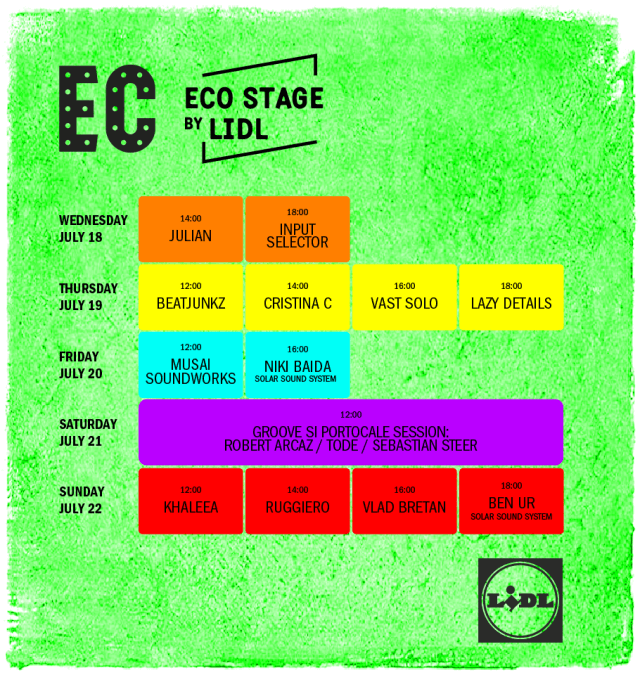 This year, the ECO Spot at the Electric Castle Festival will have its’ own stage, powered and supported by Lidl Romania. And as you already know, the stage will be 100% friendly to our environment, using the Solar Sound System which runs on solar and kinetic energy. If the sun will shine high and bright and if the festival people don’t stop pedalling, you’re in for a party! But who exactly are we going to fuel? 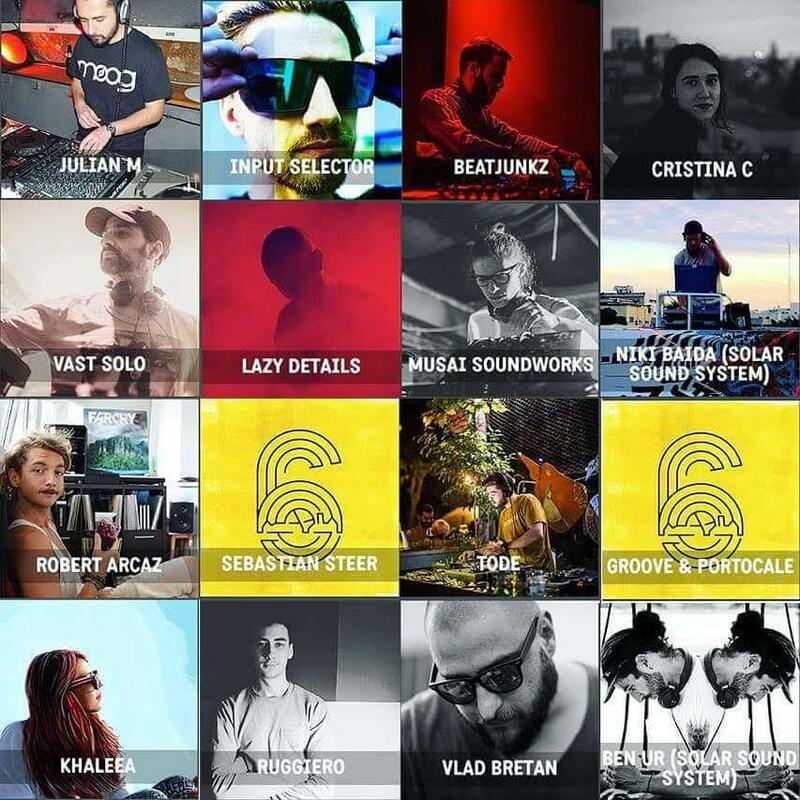 A line-up that combines Romania’s most noticeable rising artists and unique international DJ’s. The result is a perfect synergy of up-beat sounds raging from house, to electro, tribal and groove. They are the ECO fighters that will animate and give more life to the camping area of the festival. The stage will be ready for you on Wednesday, the 18th of July, with its’ first guest Julian M. starting 14:00. From Tuesday you can see your favourite artists perform here daily starting 12:00. Put your dancing shoes on and meet us at the castle. Or in this case your sneakers, you’ll definitely need sneakers for pedalling! Summer has already made its full presence since about a month now. We can stay out late and we constantly feel the need to eat ice cream. But most importantly, our minds wander more. We think about dancing our shoes off while our faces are covered in sunshine. Thinking about those blissful moments which we’re gonna experience at Electric Castle 2018. Of course, we’re all preparing our festival outfits in advance. We’re also thinking ahead of what artists we’re gonna see and making fun “to do” lists. However, the mindset we bring to Bonțida is most decisive when it comes to the amount of fulfillment we’re gonna get at the end. It’s dandier than any brand new shoes we’re gonna wear. Why? ‘Cause taking care of the Banffy castle and its surroundings is important. Supporting the ECO cause which affects all of us is crucial. 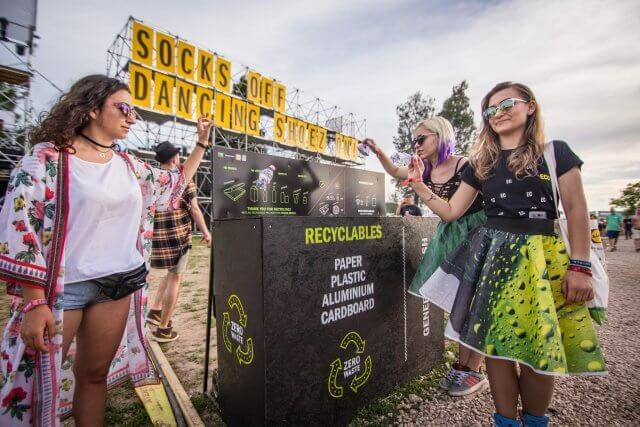 Basically, treating the dance-floor with respect and driving eco-responsibility through music is uber cool. 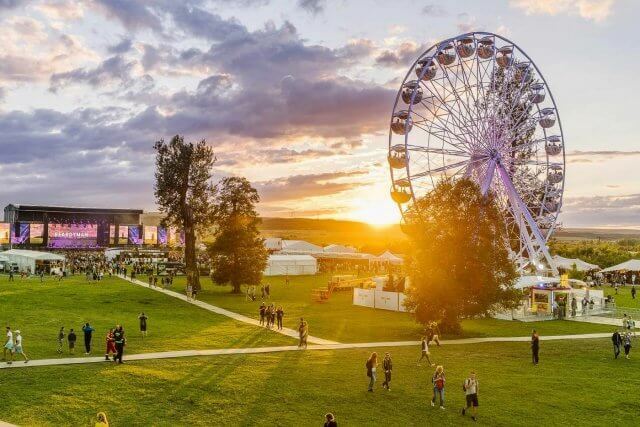 In 2018, MAINOI‘s ECO Program of Electric Castle proudly celebrates 5 years of sustained progress towards implementing sustainability standards at the festival. We’re still riding along the journey towards creating the most ECO-friendly festival in Romania. Together with Lidl, we are continuing the #ZeroWaste mission, our long-term objective to reduce, reuse and recycle all the waste generated during the festival. Last year, when we launched the #ZeroWaste mission, we managed to recycle 65% of the waste produced. This year we are raising the bar to 75-80% recycling rate. But, there is a catch: we can only do it with all of you onboard! Everywhere in the fe stival, you will find recycling stations for recyclables (aluminum, plastic, cardboard, paper) and general trash. Thus, recyclable materials are not being discarded together with the other garbage but will get a chance to a second life. If you camp, you will receive a disposable green bag for your recyclables and a black bag for your trash; please use the bags accordingly and bring the green bags, full with recyclables, at the ECO Spot, near the Lidl store, to get cool incentives in return. In addition, as of this year, we will be running the awesome NO STRAW policy, therefore you won’t receive plastic straws with your drink. However, if you insist, biodegradable straws made from 100% compostable materials, will be available for you, at the bars, upon request. We have a contest that might really spark your interest! Help us raise awareness on our eco activities by showing the whole wide online world your perspective about the ECO program. 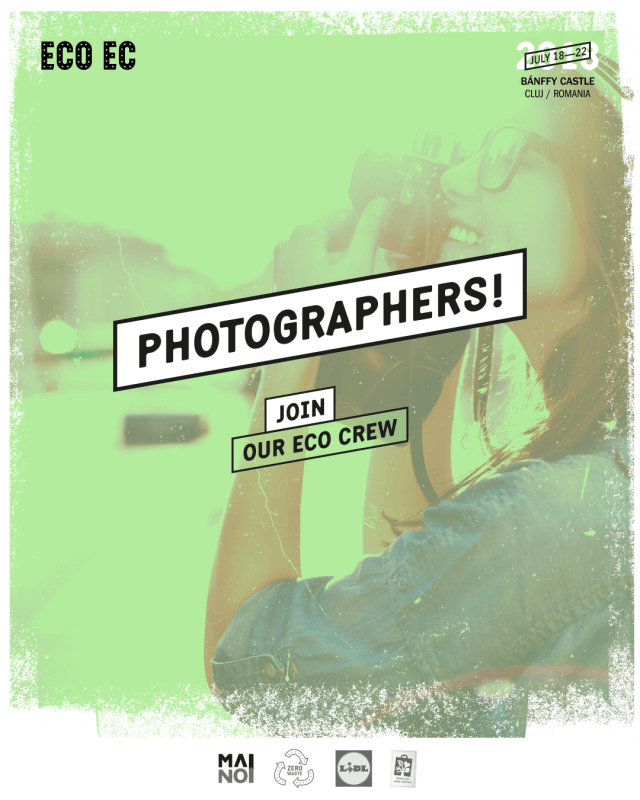 Use either your lens or your writing skills in the most unique and surprising way, and get the chance to win great eco prizes! We’re expecting images, videos or articles that showcase the sustainability practices you observe at the festival, but we don’t mind if your imagination goes further than that! You only have to post your creative content on your social network (Facebook, Instagram, blog, etc.) with #ecoec and #zerowaste hashtags, send us the link at electriccastle@mainoi.ro, until 24th of July, and you can win a bicycle, a solar backpack, and other nice props to help you become a legendary EcoCitizen. This year you’re going to simultaneously pedal and dance at our ECO Spot, as we are going to set-up the first solar stage ever at a Romanian music festival, by bringing the unique Solar Sound System to the Banffy Castle for your musical delight. One of the most engaging alternative transportation with zero carbon footprint awareness campaign is the ECO Ambassadors, now at its forth edition. 40 cyclists who will hop on their saddles and pedal for more than 250 km to get to the Electric Banffy Castle to promote the idea that cycling should be considered a national objective, being a zero carbon footprint means of transportation.. Greet them at arrival, on Wednesday, at 18h00, at the festival’s entry gate and celebrate together afterwards at the Beer Garden. 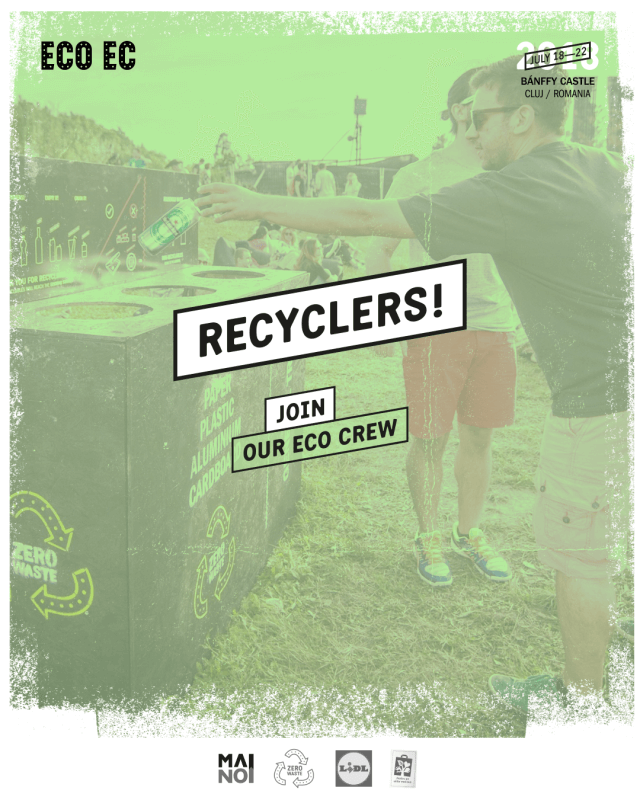 Electric Castle 2018 is incredibly close and the time to kick off the recruitment for the ECO Team has come! L.E: Deadline extended on some roles, check below! You will join the waiting list & if you are the kind of people with flexible schedule there are many chances you’ll get a call. Every year, wonderful people have joined our team with the belief that Electric Castle is the place where their contribution to change is guaranteed. 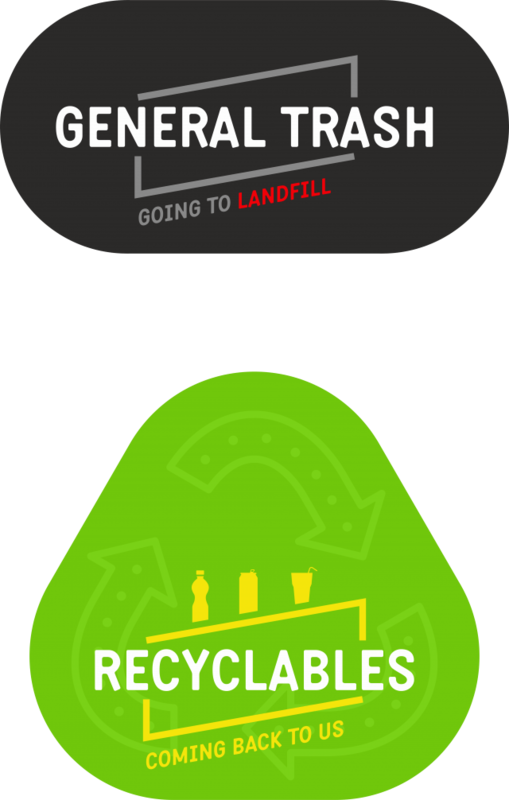 This summer we continue the #ZeroWaste campaign, which is our long-term goal of reducing, reusing and recycling all the waste generated at the festival. Last year we recycled, with the efforts and enthusiasm of the entire team, 60% of the waste created during the festival. In 2018 we want to aim even higher, who’s with us? Every year there is always a positive energy around the ECO Spots. Here only good music is playing and anyone’s welcome to join! coherence and expressiveness in speaking Romanian and English (advanced level). >>>APPLY HERE<<< until Friday, June 22nd. / 8 hour shift during the day. involve festival goers in an ECO questionnaire about their recycling habits and their level of satisfaction for the program. / 6 hour shift, 16:00-22:00 and 22:00-04:00.
wear the ECO team uniform (overalls, t-shirt – don’t be afraid, it will be very cool 🙂 ). have experience in photography at outdoor events. >>>APPLY HERE<<< until Friday, June 15th. 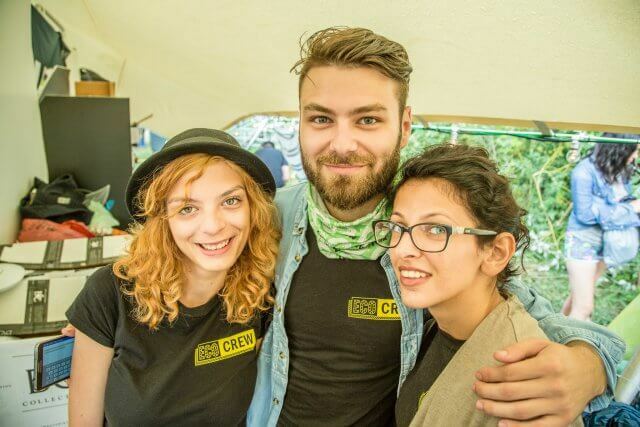 Electric Castle 2018 este incredibil de aproape și a venit momentul să dăm START-ul recrutărilor pentru echipa ECO! În fiecare an, oameni minunați s-au alăturat echipei Mainoi din convingerea că Electric Castle este locul în care au garanția că pot contribui la schimbare. Pentru ediția aniversară – 5 ani de program ECO – punem la bătaie zeci de roluri de voluntari, promoteri, reciclatori și fotografi, pentru a susține principalul scop comun: crearea celui mai ECO festival din România! Vara aceasta continuăm campania #ZeroWaste, care constituie obiectivul nostru pe termen lung de reducere, reutilizare și reciclare a tuturor deșeurilor generate în cadrul festivalului. Anul trecut am reciclat, cu eforturile și entuziasmul întregii echipe, 60% din deșeurile create pe parcursul festivalului. În 2018 vrem să țintim și mai sus, cine e cu noi? În jurul ECO Spot-urilor din fiecare an se adună mereu o energie pozitivă aparte, se leagă constant prietenii, se ascultă muzică bună și oricine e bine-venit. ajute echipa ECO la orice este necesar si tine de specificul organizarii unui eveniment de outdoor. coerență și expresivitate în vorbirea limbii române și a limbii engleze (nivel avansat). >>>APLICĂ AICI<<< până vineri, 15 iunie. / tură de 8 ore pe timpul zilei. >>>APLICĂ AICI<<< până vineri, 22 iunie. / tură de 6 ore, în intervalele orare 16:00-22:00 și 22:00-04:00.
poarte echipamentul de echipă (salopetă, tricou – nu vă fie teamă, vor fi unele foarte cool 🙂 ). UPDATE 13th July – The Eco Game is up and running! Come visit us at the ECO Spot in the camping! 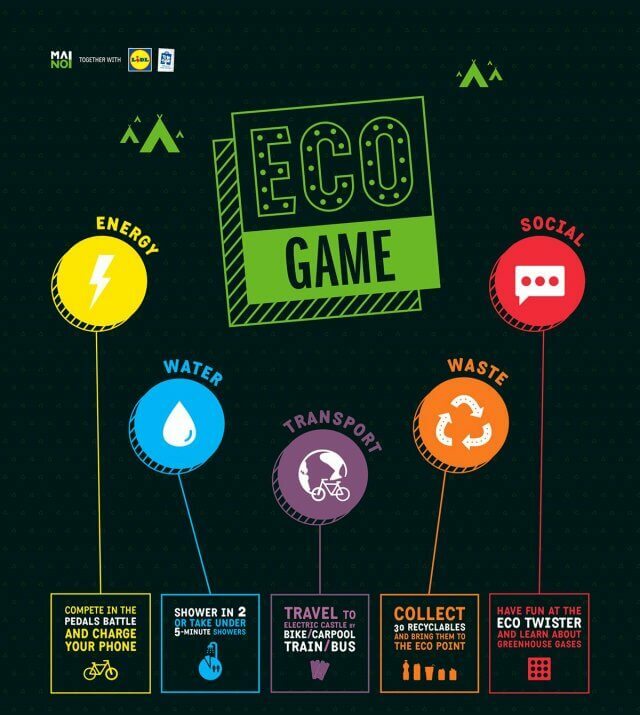 UPDATE 12th July, 19:37 – The ECO Game will start tomorrow, Thursday, 13th July. We will announce the exact starting time through another update on the Regulation’s webpage. Stay tuned! Are you a camper of Electric Castle 2017? See you soon! Find us in the camping, sign up at the ECO Spot and start the journey of an Eco Citizen. We’re looking for nature lovers, people who want to take action and lead by example. You are most welcomed in our cosy spot. 🙂 Pedal the best out of you at the charging point and have fun playing the ECO Twister! You can become Eco Guardian, Angel or Legend of Electric Castle. What you need to do is to complete between three to five activities and get the chance to win some cool merchandise, a 2018 Premium EC Pass and a Iute Bike. Read the FULL regulation below. 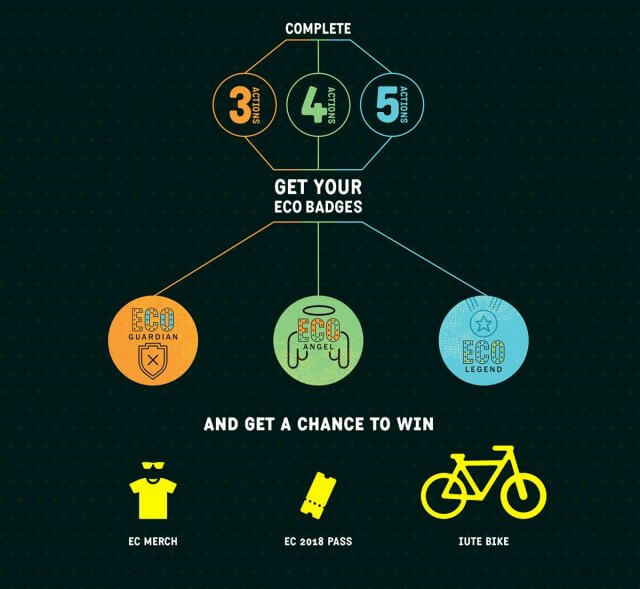 What ECO Citizen title can you gain at Electric Castle? An ECO-Guardian (for 3 eco-actions completed), an ECO-Angel (4 eco-actions completed), or maybe even an ECO-Legend (all five eco-actions completed). Citește în limba română: Regulament ECO GameContinue Reading.. 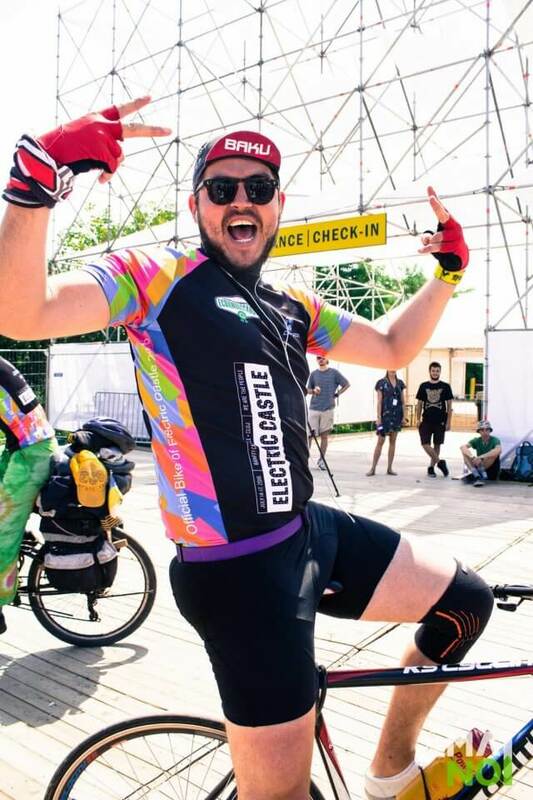 If you and your friends are cycling enthusiasts and got the rhythm in your veins, hop on your bike and have a blast at Electric Castle Festival. It’s on us! Free full pass, camping & other goodies await you at the gate of the Banffy Castle (Bonțida, Cluj). Radu, a 2016’s ECO Ambassador, arrived at the Electric Castle after travelling 500 km by bicycle. 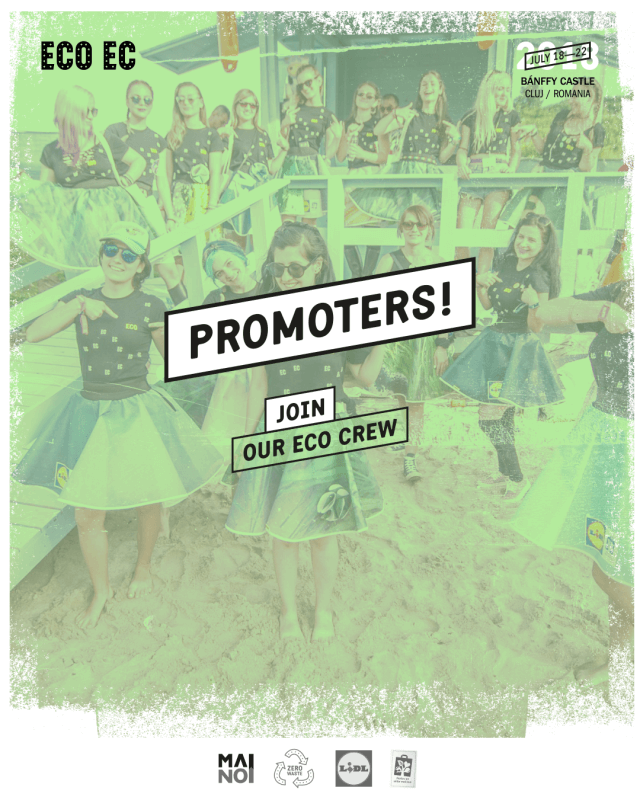 What do you have to do to become an ECO-Ambassador? Choose an eco cause to promote before, during and after the festival. Any cause from deforestation to ecological education. Are you already working for a cause and you’re motivated to support it in the long run? Even better, your chances of being selected increase. Pedal to the Banffy Castle from a distance greater than 250km. Be visible online, a good communicator and active on social media (Facebook, Instagram, Twitter). The stronger your ability to reach people, the greater the chance of being selected. Own a smartphone/tablet with mobile data. It is very important to have a device with Internet connection to share media content (photos, videos, live streaming) during your journey. Have a public Strava account / other biking app. It is useful for proving your experience in pedalling on long distances. You will have to use this account to track your journey by bicycle towards Electric Castle. 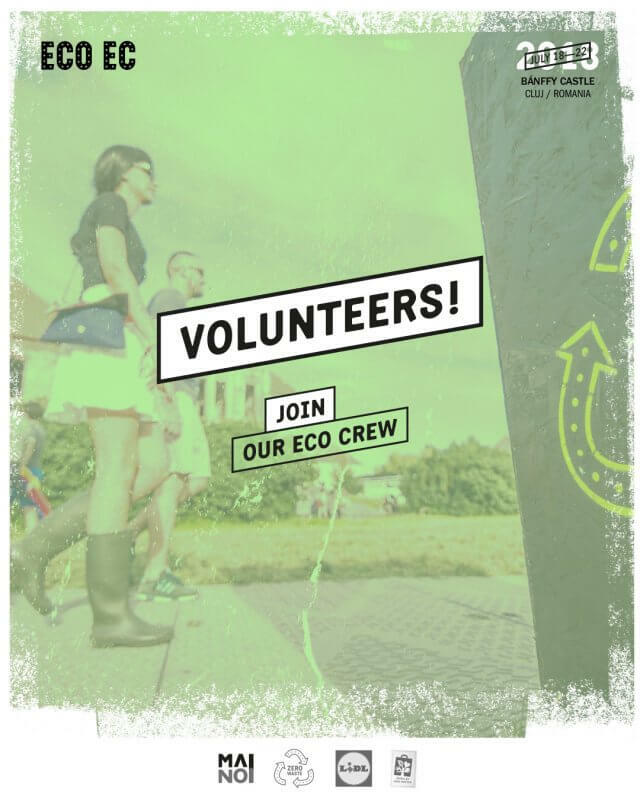 Have the determination to convince as many festival participants as possible to join the ECO program at Electric Castle. Own suitable cycling equipments and bicycle for this kind of journey. Be experienced and physically capable to complete this kind of journey in safe conditions. Plan your journey ahead. We need you to be in Cluj-Napoca in the morning on the 12th of July (place and time TBA). We greatly promote team working, but we also accept lone wolfs. Continue Reading..
UPDATE: Regulamentul s-a modificat la articolul 6 – Premiile. Toate categoriile de premii vor fi acordate prin tragere la sorti, cu random.org, in ctombola fiind inscrisi toti participantii care au facut cel putin o actiune ECO. ECO Challenge este provocarea pe care ți-o aruncăm la Electric Castle 2016: fii ECO, distrează-te și învață să protejezi mediul! Concursul este un joc prin care încercam să găsim cei mai ECO participanți la festival și să îi premiem pe măsură. Tot ce trebuie să faci este să îndeplinești cu succes cât mai multe activități ECO din cele cinci categorii: Energie, Apă, Transport, Deșeuri și Social, și astfel să aduni cât mai multe puncte. Înscrierile se fac la ECO Spot-ul din festival, amenjat fix la intrarea in hide-out. Pentru acțiunile care au loc în camping (dușuri sau cinema) voluntarii vă oferă cartonașe pe loc, pe care ulterior trebuie să le preschimbați în puncte la ECO Spot din festival. Acțiunile ECO se validează de către un voluntar ECO-Crew prin înscrierea directă în baza de date la ECO Spot. Fiecare acțiune se punctează o singură dată. Participanții trebuie să ofere datele de contact corecte și să fie de acord cu Regulamentul concursului.